On December 6, the Bank of Latvia issued a new coin marking the centenary anniversary of an important series of battles occurring around Christmas 1916. The Christmas Battles, as they are called, are considered pivotal in the awakening of the Latvian desire for independence. 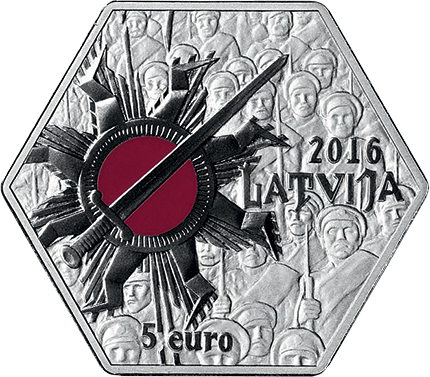 The new coin is dedicated to the Latvian riflemen, heroes of the Christmas Battles, and their contribution to the future of all Latvians who were then unwillingly living within the confines of the decaying Russian Empire. The Christmas Battles occurred from the 5th to the 11th of January, 1917 (Julian or old-style date 23rd to 29th of December, 1916), along a 30-kilometer (18-mile) front line that stretched from Tīreļpurvs to Olaine. Latvian national military units were joined in one division under Major General Augusts Ernests Misiņš (1863–1940), who was later made the first general of the Latvian army. The struggle and what was to come during and after the Great War would result in eventual independence for the first time for the Latvian peoples, who will celebrate statehood and the centenary of the republic’s declared and official year of independence in 2018 and 2012, respectively. The 2016-dated hexagonal coin is struck by the Mint of Lithuania on behalf of the Bank of Latvia and designed by artists Kristaps Ģelzis (graphic design) and Ligita Franckeviča (plaster model). On the obverse, against a background of Latvian riflemen, is a stylized sun from the Latvian riflemen’s badge, with its red-painted central field, eight broken sunbeams, and slantwise-situated sword. The year 2016 is on the right, with the inscription LATVIJA underneath and, at the bottom, the inscription 5 euro. 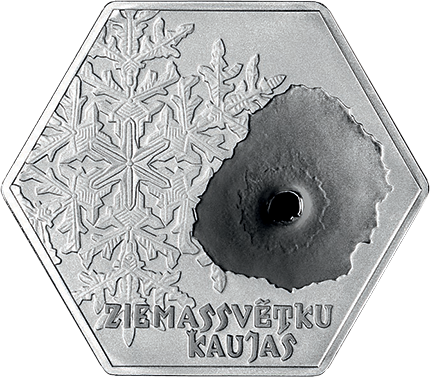 The reverse features a snowflake to the left, and at the right, the point of a bullet’s impact, with the inscription ZIEMASSVĒTKU KAUJAS (Christmas Battles) placed at the bottom. What these budding riflemen had heard and stored away in their hearts soon was confirmed with their blood when the command of the Russian 12th Army made plans to push the German troops across the Lielupe and begin the recovery of Zemgale. 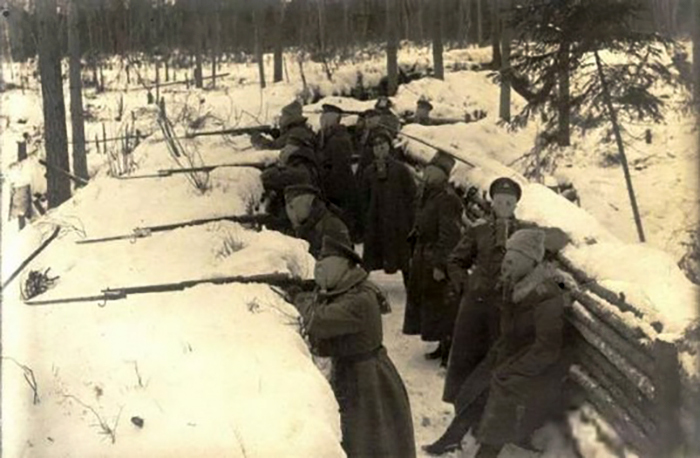 Two brigades of Latvian riflemen (eight regiments), riflemen from the 6th Siberian Corps, and some other units were involved in accomplishing this task. Latvians were united in one division under the command of major general Augusts Ernests Misiņš (1863–1940), who would become the first general of the Latvian army. During the sudden, blizzard-cloaked attack on the German positions, the riflemen encountered the cruel new innovations of war. The development of defense technologies then surpassed the means of attack and capabilities in terms of equipment. The outdated and irresponsible tactic of frontal attack ended in huge casualties, as the Latvian regiments lacked artillery support. They were forced to run through extensive traps of barbed wire and expose themselves to the massed fire of countless German machine-guns. The situation was exacerbated by a severe cold spell, yet the Latvians managed to break through the substantial defense system of the enemy and drive a wedge of several kilometers through German lines, taking even the most menacing German fortification, Ložmetējkalns. Despite this gain and morale-booster, the attack petered out mainly due to poor leadership by the Russian 12th Army, which had not prepared further plans. As the attacks subsided, the German forces immediately launched a counterattack, partially reclaiming their lost positions in January battles. After the cessation of hostilities of the Great War, Latvia would indeed emerge from the remnants of the defunct Russian Empire as an independent nation, declared in November 1918 and officially achieved on January 26, 1921. This independence was short-lived, however. On the brink of new hostilities in 1939, German and then Soviet forces invaded and occupied all three Baltic nations, eventually (and illegally) incorporating Latvia, Lithuania, and Estonia into the Soviet Union in 1944. Latvia would not reestablish its independence for another 47 years, with the eventual collapse of the USSR in 1991. I always love to see innovative designs and concepts to see just what Mints are capable of doing, what they’re able to design and produce from a small piece of precious metal or even base metal. This design I think was very appropriate and well represented in the design, well done to both the designer and Mint of Lithuania.